Review: Jack Hall makes a terrifying trek to New York City from Washington D.C. to reach his 17 year old son Sam, where he and some friends are competing in a High School academic competition. 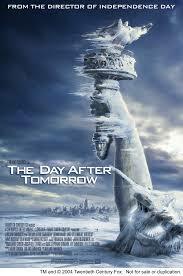 His son gets caught in a sudden international storm which plunges the planet into a new Ice Age. It comes as a shock to Jack as what is about to happen to him, to his son and also to the planet. The script is a bit on the cheesy side but it manages to get away with it. The performances are very melodramatic. One element I was particularly impressed with is the special effects. The director estimated that at least one thousand digital artists worked on the film. This is the highest grossing film to be made in Canada. At the Bafta Awards in 2005 this won Best Achievement in Special Visual Effects.